Are you a startup founder, techpreneur or an entrepreneur? Do you want to learn how to maximize and benefit from Microsoft’s cloud and BizSpark platforms? You might want to join this free training. 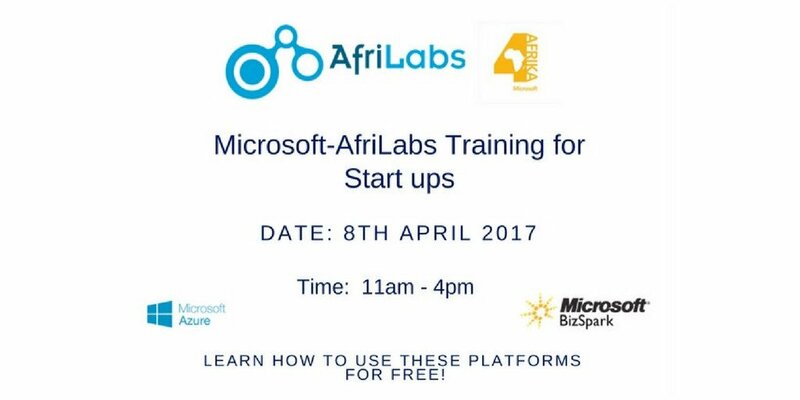 Microsoft in collaboration with AfriLabs is hosting a FREE technical training for startups on the 8th of April, 2017 in Lagos, Nigeria. This training will be focused on the use of Microsoft’s Azure and BizSpark platforms and how they can be used to improve technology based businesses. Microsoft BizSpark is a global startup program that helps startups grow faster and succeed by giving them free access to Microsoft Azure cloud services, software and support. The startups receive three-year access to Microsoft software development tools, marketing visibility to help promote their business and a connection to the BizSpark ecosystem, giving them access to investors, advisors and mentors. AfriLabs host of training are a technology networking and acceleration association that supports technology incubators & accelerators in Africa. With a network of 50 technology innovation hubs in over 20 African countries. Spaces are limited so do well to register early. Click here to register and participate in the training. Here’s a recap of the five hour session participants spent acquiring new skills as shared by AfriLabs.